Finally we know where they come from! 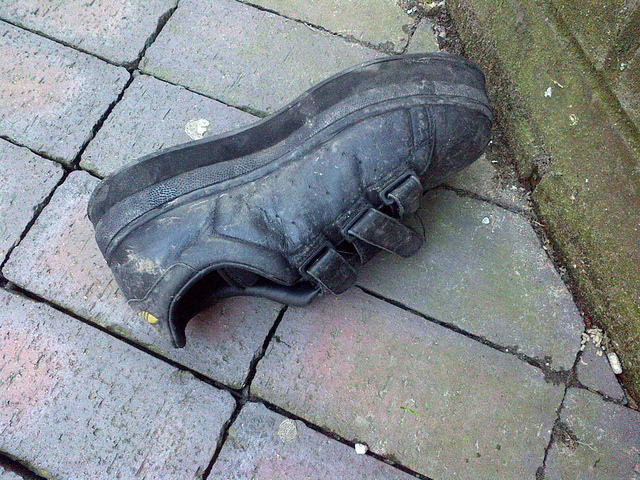 Have you ever spotted a single shoe lying by the side of the road and wondered where it came from? You're not alone - in fact, there's a name for it: the One Shoe Phenomenon. The topic even has its own Wikipedia article! My environmental biology teacher repeatedly said this and I've echoed it a million times: the earth will survive us. Sure, we'll probably destroy each other because we can't even vote properly, but once we're gone the planet will grow over our civilization, heal and repair itself. Have you ever seen that show Life After Earth? That shows what it will be like once we're gone and the planet forgets that mankind ever existed. Does the idea of our universe being a virtual reality world totally terrify you? Ever since I read about the idea, I've been fascinated with it, but I wasn't scared until tonight when I had a terrifying dream (within a dream, within a dream) that was not only jarring but guided by a smug-looking woman I saw prior to falling asleep in my mind. Is this world real? When you think about cancer, it's usually about the destruction that cancer is known to wreak on peoples' lives. It's never about creation, which makes this news so mind-blowing: a new species has been brought forth through cancer cells. Tobacco farmer Henrietta Lacks had a strange tumor in 1951 that baffled doctors. It was unlike any other cancer previously discovered or discovered since, so of course doctors were interesting in studying the unique cervical tumor. Are you one of the many people who doesn't buy a store's brand of ice cream because you've heard that it won't melt, so it's not real milk? How about one of the people who insist that grated Parmesan cheese is really sawdust? I'm one of those people, too! The thing is, we're only partly right. Store brand ice cream, for example, may really still have milk in it even if it does contain ingredients that keep it from melting (and tasting weird).